Some dogs eat clothes. And for a dog who doesn't discriminate against garments as a form of potential sustenance, a sock might make for a good snack. But we all know snacking's better in moderation. There's a difference between one or two socks and say, forty-three of them. Or forty-three and a half, which is the number of socks one Great Dane ingested and had to have removed from its stomach. 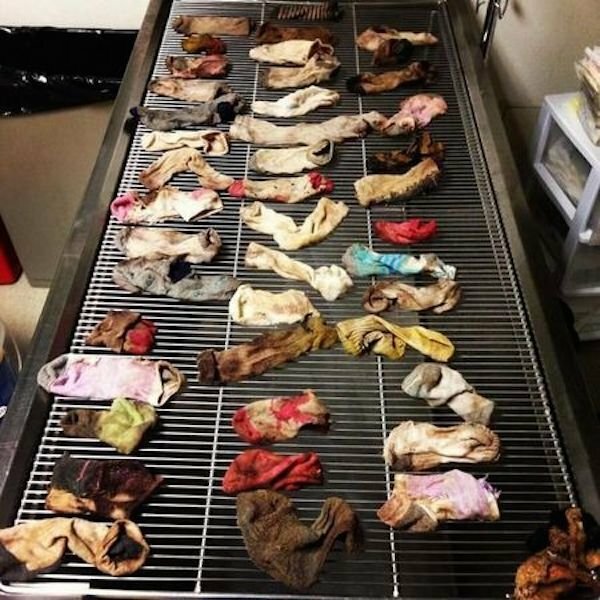 Portland-set DoveLewis Veterinarian posted this photo, which shows the 43.5 socks that had to be removed from a three-year-ld Great Dane's stomach. Pet-lovers out there know the kind of joy a pet can bring to a household, and also the kind of anxiety that comes with having a sick animal. In this case, it sounds like the situation was quite serious, but it produced a story that's since made its way around the internet, thanks in part to the sight of a table covered in a variety of socks that once saw the inside of a Great Dane's stomach. So the story goes, the dog's family brought their dog in to the nonprofit animal hospital to be checked out when they found him vomiting and retching. The vet took some x-rays and discovered a massive amount of "foreign material" in the dog's stomach. When they performed surgery to remove it, they found socks. A lot of socks. So it seems there's one family out there that now knows where all of their missing socks have gone. The rest of us will have to keep looking. And on an even brighter note, DoveLewis says the dog recovered smoothly from its surgery and was discharged home the next day. Hopefully, it's switched to a more digestible snack. Photo credit for both pictures goes to DoveLewis.org, which also has a number of X-Ray images that show what the socks looked like inside the Great Dane's stomach.